Recommended to me as one of the best restaurants in the region, Bebek Bengil did not disappoint us for one bit. There was a complementary Valet service in front of the restaurant. It was a little dark when we walked into the restaurant and the attendant asked whether we wanted to sit on the table or lesehan (kinda like Japanese tatami seats). On our way to the table we walked in the middle of paddy (rice)’s field. We were seated on a small hut that has two sets of table. It was quite an open space but yet feel very private because in between huts lies paddy fields. The menu book looked like a novel since it had a lot of pages with blank spaces put in generously. It was a quite unique menu with specials written inside a box. 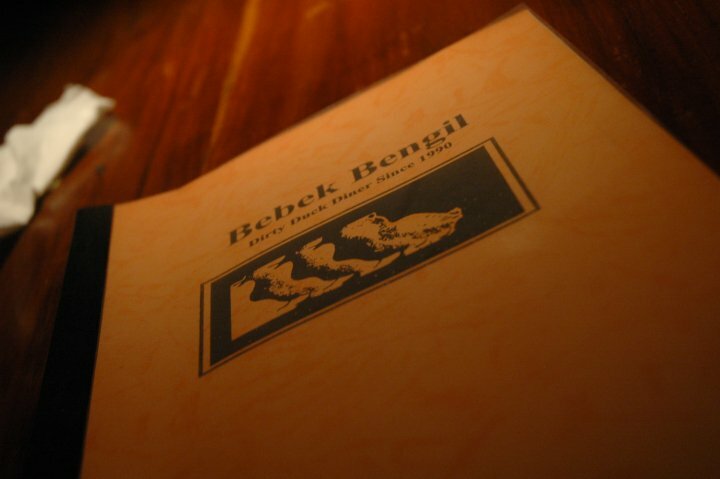 This time we skipped on appetiser; jumped into main course and ordered the named restaurant, Bebek Bengil. It’s half a duck cooked to golden brown and really crispy and served with a bowl of rice. 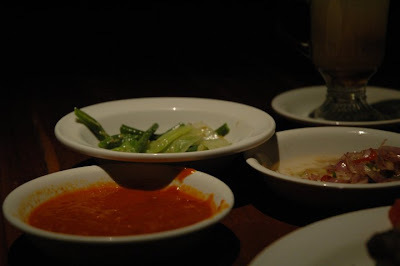 We were given two bowls of condiments and one bowl of vegetables. The condiments are a bowl of chopped chilli and onion and massive amount of chilli hot but with medium hotness. 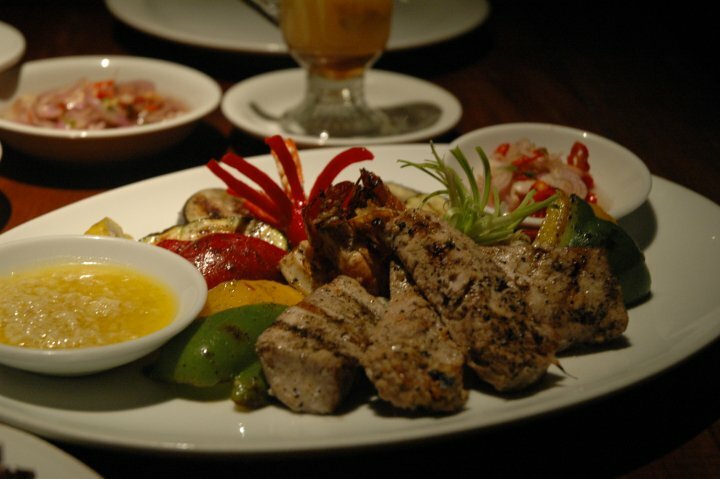 The duck’s crispness is the restaurant’s trademark, combined with their sauces. 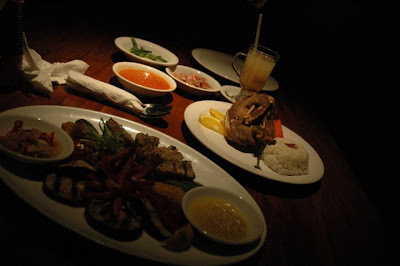 For the other main course, we ordered Fresh Grilled Seafood. Presentation wise, it looked a lot more appealing than the duck. There were 4 slice s of snappers, 3 prawns, and 6 grilled calamari in the meat department and 2 slices of red, yellow, and green paprika, eggplant. There were also condiments for this dish: garlic oil and chopped chilli onion. It would easily be shared between two people! 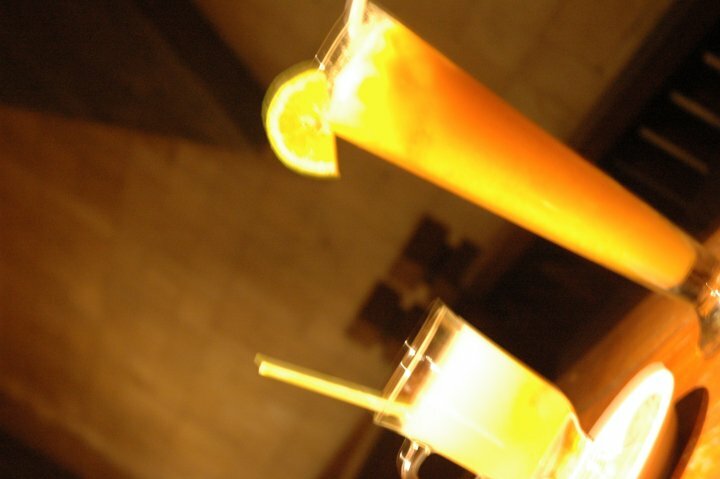 I might say it was a mistake to order the drink: Yellow Giant Duck, because it was really giant *sigh*. However the combination between the mango and pineapple (possibly with a little bit of orange juice) was nice. 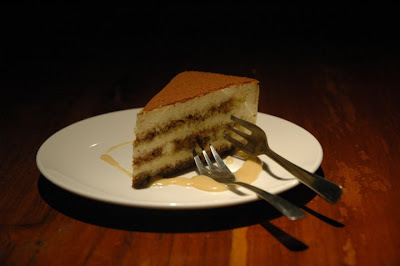 As if those dishes were not enough, we also ordered Italian tiramisu for dessert. 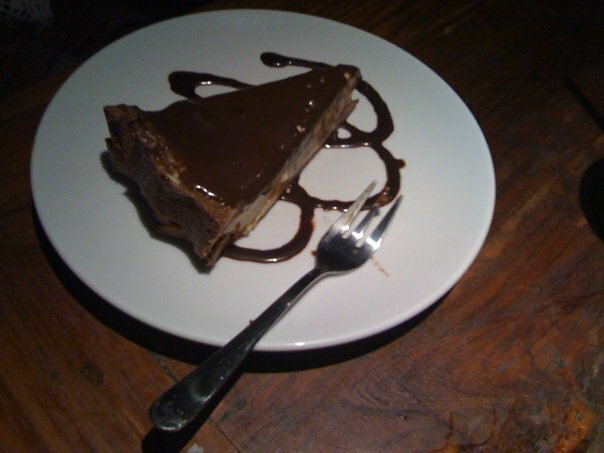 It was quite nice – I would rate it quite better if I did not have my favourite tiramisu on my mind (Badde Manor’s of Sydney). The tiramisu was creamy and I think it would have been much better if it were softer. We were lucky enough to taste their best dessert in the restaurant: The Black Russian. The cake was quite soft and yummy with great tasting cream on top. Bali… I’m sure everyone would know everything there are about Bali. 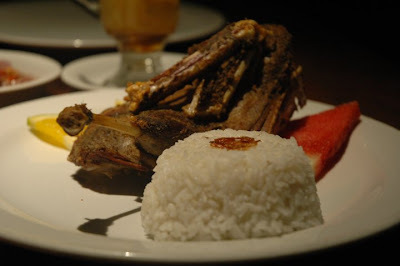 I’m just gonna tell you about a little piece of Bali called Ubud, this is where bebek bengil is located. Unlike Kuta or Nusa Dua, Ubud is the place to rest your mind, body and soul (and that’s why there are hundreds of spa houses). The place is very relaxing and great for quality holiday away from crowds. We stayed in a resort called Beji Ubud Resort. It was such a fantastic new resort. Ubud is famous for its numerous art galleries, traditional dance shows, and monkey forest.